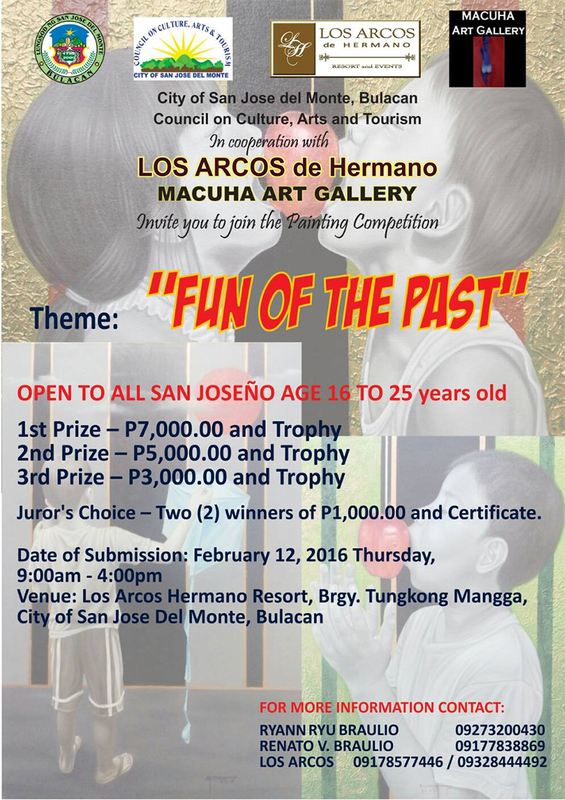 Fun in the Past is organized by Council on Culture, Arts and Tourism in order to promote the visual arts among the emerging Filipino artist and constituents of the City of San Jose del Monte, Bulacan. Los Arcos de Hermano Resort and Events is a five hectare lot located in lush greens of the Paradise Farm of San Jose Del Monte, Bulacan where old and big mango, narra, acacia and other fruit trees flourish which opened since March 2012. Los Arcos also hosts events like weddings, debut, party, seminars, team building, and other special and corporate events. For more information on Los Arcos, you can visit their site at http://www.losarcosdehermano.com/ or email them at LosArcosdehermano@gmail.com or Marketing.Losarcos@gmail.com.